“Running for me is like medicine,” says Bobbi Gibb, a Rockport resident who was the first woman to complete the Boston Marathon. 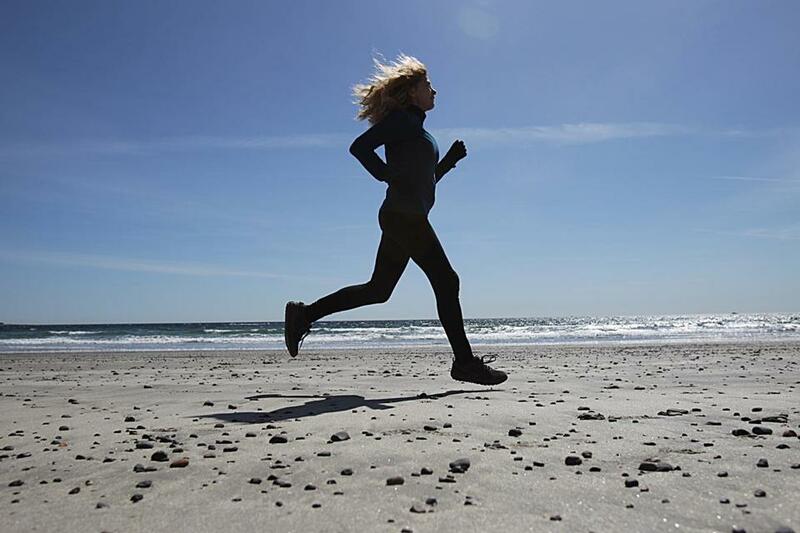 ROCKPORT — These days, if the weather’s not great, Bobbi Gibb is still determined to run. She’ll do it indoors, running in place on a small trampoline. However belated the recognition, she’s now considered one of the race’s most notable participants. Having lived a private life as a lawyer, neuroscientist, artist, and single mother, Gibb has agreed to be feted in her golden anniversary year as the marathon’s Grand Marshal. She’s also making appearances with her seldom-seen artwork — vibrant paintings and murals as well as works in her primary medium, sculpture. For years she has hoped to cast her scale model of a lithe female runner in life-size bronze and install it somewhere along the marathon route. Now, with her 50th anniversary underway, that dream may be headed toward reality. Some of Gibb’s sculptures. 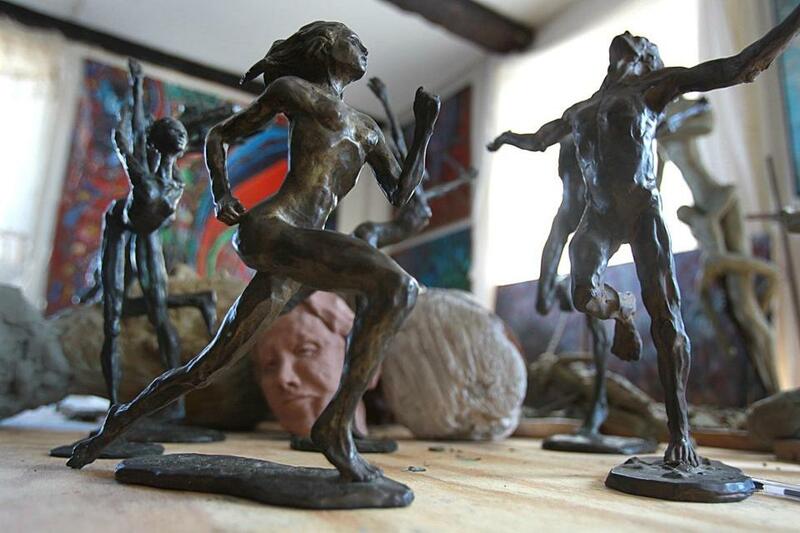 For years, Gibb has hoped to cast her scale model of a lithe female runner in life-size bronze and install it somewhere along the marathon route. Now 73, she’s been married “many” times, she says with a laugh. (Actually, three.) For years she has spent the winter months in Southern California doing lab research, trying to find a cure for ALS. She divides her time on the East Coast between Rockport and Cambridge, where she stays in a shared home with some old running friends and her adult son, Leif. In Rockport, she lives in a cramped old colonial home, with a tenant on the first floor where her late mother had lived. There are few places to sit; most of the space is occupied by flat surfaces crowded with the detailed busts she forms in wax. 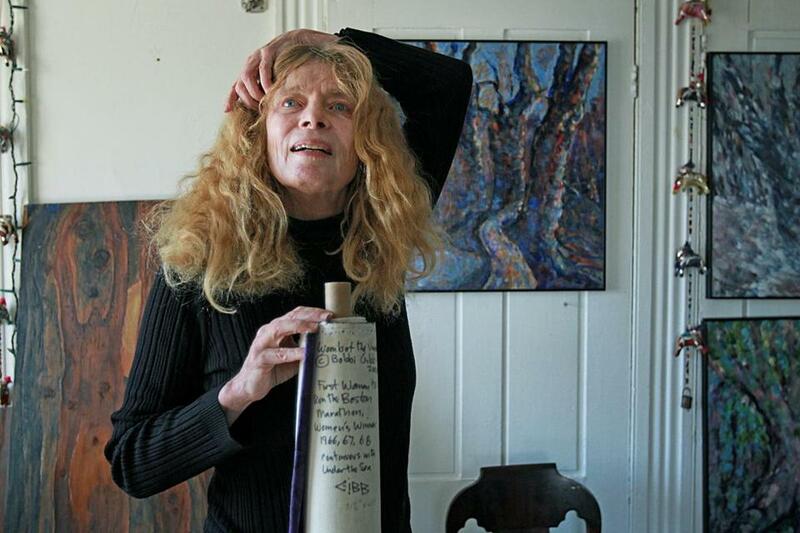 For years she’d memorize a stranger’s face on the subway, then come home and sculpt it. She also does historic figures from photographs. Her Einstein is uncanny. After studying at the School of the Museum of Fine Arts, she designed the bronze figure given as trophies to the top three women marathoners at the 1984 US Olympic trials. One belongs to Joan Benoit Samuelson, who went on to win the gold medal that year, when the Olympics introduced the women’s marathon. For Gibb, running has always felt like a spiritual activity. 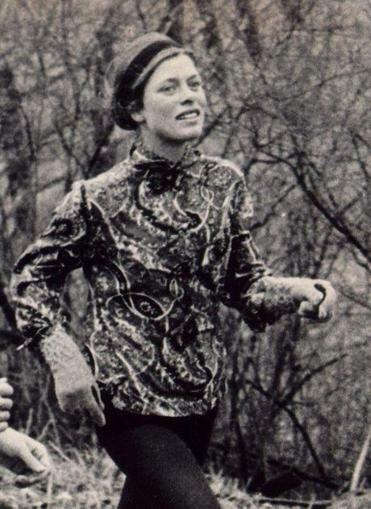 Gibb ran along the Marathon route in 1967. Her parents nurtured her curiosity. As a child growing up in Winchester, Roberta Louise Gibb collected pond water with her father, a chemistry professor at Tufts, and studied amoebas under a microscope. Today, several of her paintings look like swirling life forms. As a young woman, her passion peaked when she discovered running. She began by jogging through the woods of Winchester, with her dog by her side. Quickly gaining confidence, she went to Vermont, where she ran alongside horses taking part in a three-day equestrian event. She did 40 miles the first day and got through 25 the second before bowing out. Not long after watching her first Boston Marathon in 1964, she wrote to the BAA for an application. Informed that women weren’t allowed to run — at the time, they were considered physically incapable of completing a marathon — she was at first incensed. Then she realized she had a chance to prove the men wrong and make a stand for the emerging women’s movement. “My outrage turned to humour as I thought how many preconceived prejudices would crumble when I trotted right along for 26 miles,” she would recall in “To Boston With Love,” a self-published pamphlet peppered with her own stick-figure doodles. The little pamphlet has been reprinted in a special commemorative edition that is for sale at a pop-up store near the Marathon finish line. The temporary storefront, produced by Tracksmith, a Wellesley-based boutique running brand, will feature a new line inspired by the cuffed surf shorts Gibb wore in 1966, which she borrowed from her brother. The “Runners’ Lounge and Showroom” will also feature select pieces of Gibb’s artwork, her sculpted figures and colorful, almost childlike oil paintings, most of which she’s never before shown to the public. Proceeds from the sale of “To Boston With Love” will help fund a campaign to find a permanent home along the marathon route for Gibb’s sculpture. When Tracksmith first began working on their Bobbi Gibb shorts, even people well-versed in running history had never heard of her, says founder Matt Taylor. Most people think Kathrine Switzer was the first woman to run Boston, he says. She’s the runner who registered under the name K.V. Switzer in 1967. Infamously, she was physically assaulted during the race by BAA official Jock Semple, an incident that was captured in an iconic photograph. Gibb, who’d entered the race unofficially for the second year in a row, bettered Switzer’s time by nearly an hour, finishing in 3:27:17. But without the drama Switzer encountered, her achievement went largely forgotten for years. “She doesn’t have a commercial bone in her body,” says Tim Kilduff, the onetime Boston Marathon race director whose organization, the 26.2 Foundation, is shepherding the drive to find a home for Gibb’s Marathon statue. Gibb returned to the Boston Marathon to run in 1996, marking her 30th anniversary. She ran again in 2001, this time raising money for ALS research. A close friend, Buck Robinson, an environmental activist and the founder of Rockport’s Toad Hall bookstore, died of the disease in 2003. She would have run this year, too, but a long winter bout with bronchitis kept her from training sufficiently. Gibb, educated as a neuroscientist at a time when women weren’t welcome in graduate-level science departments, has devoted her research since Robinson’s death to chasing a cure for the disease that took his life. She works closely with Dr. Robert H. Brown, chair and professor of neurology at the University of Massachusetts Medical Center and Medical School, a leading researcher in the field of neuromuscular diseases. Long before it became a billion-dollar ad campaign, it was all the motivation Bobbi Gibb would need: Just do it.